Plot: Chances are you’ve heard of this movie, or even more than likely seen it, so I apologize in advance for the lateness of this review. I had been eagerly awaiting this flick ever since I first saw a trailer for it. I went and found the short film that it was based on. I even re-watched all of the Halo movie footage that the director did as a test to showcase how he would shoot the movie (which has yet to be green-lit). I was so thirsty for this flick that, for some strange reason, I decided to hold off on quenching my need to see it. I should’ve been in a chair for a midnight showing with anyone and everyone who was willing to come with, and we could’ve basked in it’s glory together…and then talked at length about the incredible subtext and messaging that litter this movie. But perhaps I’m getting ahead of myself here…. District 9 is a movie shot somewhat documentary style (for about the first third of the flick) about an alien space craft that arrived on earth 28 years ago over Johannesburg in South Africa. The reason for their arrival is never really explained, but we humans come in and take them off their ship and force them to live in slum-like conditions on the ground. 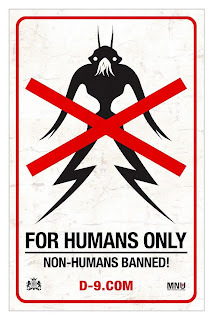 An organization called Multi-National United (MNU) is formed to police the aliens (the slur that they use for them in the movie is “prawns”), and the flick takes place during a relocation / eviction effort to get the aliens further away from people in the city. Unfortunately you kind of have to have seen the trailer to understand why this is going on (although they very briefly touch on it in the flick), but ultimately the humans want to use the alien technology (specifically, their weapons), but the technology only works with the alien biology. Enter Wikus Van De Merwe (Copley), the agent put in charge of the eviction. While searching a slum house “owned” by a prawn named Christopher Johnson, he discovers a cylinder that sprays him with a strange liquid, and he starts to get really sick. And it turns out that the liquid in the canister is starting to change his DNA. He’s becoming an alien! Of course, this means that the humans want to slice and dice him up and figure out how to replicate it, so they can use the technology. Of course, he escapes and goes to live in District 9 where he runs into Christopher again, and the purpose behind the liquid is revealed. What follows is one of the most intense and awesome third acts that I have seen in ages, chop-full of all the kind of sci-fi action that you would expect from an R-rated foray into the depths of the human condition. And as a good sci-fi should, the movie is littered with moral subtext commenting on the world we live in today, and the situations going on over in Africa especially. But even if you don’t dive that deeply into it, you can still enjoy the awesome that is this movie. When my brother and I went to go see this movie at the local theater, we accidentally walked into the wrong theater. As the opening credits for “Inglorious Basterds” started, a look of horror and disgust flashed across my face. In case you didn’t know, I’m not a fan of Tarentino movies. My brother’s face said something more like, “I could watch this,” but I was not going to have it. I had been waiting too long to see this movie – telling myself that I was waiting because I feared a negative theatrical experience like I had with Watchmen. Thankfully, the crowd was light and we were able to separate ourselves from the bulk of the people. The flick was everything that I thought it would be and more – and it’s certainly something that I’m going to buy on DVD, if for no other reason than to check out the special features and commentaries. If you enjoy good sci-fi, action movies, flicks with people and stuff blowing up all around, or just want to see something done in a very unique way, be sure to watch this movie! Yea, District 9 kinda’ blew my mind. Such an amazing film… on so many levels. Yeah, I really dug it. Fun action, but also a great call-out to classic sci-fi with a deep subtext.